The computerization of Astrology has brought revolution in the field of astrology. People well versed with the programming and astrological knowledge created astrological software to cater to the need of astrologers not only to get computerized horoscope instantly but also comprehensive astrological calculations within a very short time. Vedic astrology software Leostar professional is most advanced, comprehensive and accurate Kundli software. In olden times astrologers used to cast various horoscopes and do astrological calculations manually which was not only an intricate process but also involved the probability of errors and mistakes. Moreover, it was a time consuming and tiring process too. Now with the advent of various astrological software in the modern era of computers the probability of mistakes is not much as there is no manual handling of data. Leostar produced by Future Point is considered to be the best choice of professional astrologers and that is why it is used globally. Leostar which supports all astrological systems is the leader in Vedic Astrology Softwares for the Professional Astrologers and beginners alike. It features a wealth of calculations, charts, tables, tutorials, and interpretive reports and that is why the Professional Astrologers prefer to use this software. Vedic kundli software Leostar Professional is based on accurate astrological calculations. This Vedic jyotish software is the result of years of extensive research work in astrology. This is best indian astrology based software. Kundli software Leostar presented by leading astrology company Future Point is easy computerized solution for complex astrology calculations and accurate prediction. Kundali software Leostar has been rightly termed as the champion of Vedic astrology calculations. The concept of computerized astrology in India was introduced by Mr. Arun Bansal who developed the first astrology software in 1978. Kundli software Leostar which brought revolution in the field astrology is the result of extensive research work of 40 years in the field of computerized astrology. Kundli Software Leostar contains comprehensive horoscope calculations with remedies and predictions. 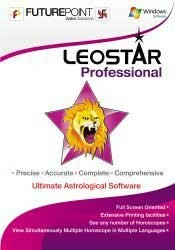 Leostar Software for Kundli took astrology closer to common peoples interest. Indian Kundali software based on vedic astrology gives method of matching soul mates. Lal Kitab and Panchangam modules of this Kundli software are very popular. Kundli Software Leostar is extremely popular for its accuracy and credibility. Parashar astrology based kundali software leostar incorporated different astrology systems and all aspects of astrology with comprehensive Calculations, Remedies, Predictions, Various Charts, Dashas, Teva, Astrology, Kundli Milan (Matching), Varshphal, Numerology, Horary, KP, Lal Kitab, Muhurat, Panchang, Mundane, Books, Calendar, Transit, Mantras and lots of other astrology information. This is also known as best kundali Milan software too. Leostar astrology software is used by all professional astrologers, astrology research institutes, computerized astrology centers and students of astrology all over the world. This astrology software is available in more than 12 languages including Hindi, English, Tamil, Bengali, Gujarati, Marathi, Oriya, Nepali, Spanish, Sinhala, Punjabi etc. In nutshell Kundli software leostar can be termed as the best representative of Vedic astrology. Traditional/Modern Annual chart, Patyansh, Mudda and Vimsottari Dasha. Calculation and detailed answer of questions on the basis of horary astrology. Muhurat for Job, Business, House Warming (Grah Pravesh), Marriage etc. Avakhada, Ashtakvarga, Festivals, Mantras, Rahukaal, Yoga, Table of 249 number of KP. World number one vedic astrology software Leostar Professional is the upgraded version of Leo Gold Professional which was originally launched in the year 1987. The market value of this vedic astrology software lies in its credibility. The reason behind its popularity is its accuracy and that is why it is used by all professional astrologers all over the world. Initially it was a DOS based software and was accepted by astrologers all over India with great appreciation. This vedic jyotish software really helped them to get most accurate calculation by just a click and saved their lots of time. With the passage of time the latest versions of software on Windows, XP and Vista were released to cater the needs of professional Astrologers in India and abroad. This vedic kundli software contains complete Astrological Calculation with Remedies, Predictions, Various Charts, Dashas etc. This vedic astrology software available in more than 12 languages including Hindi and English with modules Astrology, Matching, Varshphal, Numerology, Horary, K.P, Lalkitab, Muhurat, Panchang, Mundane, Books, Calendar, Transit, Mantras and lots of other useful informations. This is perfect business tool for professional astrologers. Vedic kundali software is based on accurate astrological calculations. This vedic jyotish software is the result of years of extensive research work. You can use this vedic astrology software easily with the little help of somebody even if you are not a computer savvy person. According to astrologers it is the easiest vedic astrology software in the world. One can get most accurate, excellent and comprehensive results from this vedic astrology software. This is unique vedic astrology software containing great features in it. Popular astrology modules Matching, Varshphal, Horary, KP, Lalkitab, Numerology, Muhurat, Panchang, Gochar(Transit), and Mundane are included in this vedic astrology more than one language. This vedic software also incorporates Sagar Chakra, Mantra, Tarot and Ramal. Astrologers can use these systems too. You can also get a print out of it. Astrologers can easily customize it according to their needs. Kundli, Dasha and Lagna chart can be used as per required convenience. Vedic astrology software Leostar is best answer to get accurate horoscopes instantly. There doesn’t remain any possibility of any illusion regarding the degrees and placement of planets. Vedic astrology software Leostar is known for getting minute calculations. This Vedic astrology is an ocean of astrological knowledge. Vedic astrology software Leostar can cast lagna, chalit, cusp, sun, moon, hora and divisional charts. Astrologers use different Dashas for getting accurate predictions. Different types of Aynanshas used in astrology like Lahiri, Kp, Raman, Jaimini, Bhrigu, Manu and Sayan are available in it. For astrologers this vedic astrology software is like a miracle. All horoscopes can be saved in it. This vedic astrology software contains longitudes and latitudes of 1 Crore cities. Teva - Contains all important charts with Dasha. Astrology - Astronomical position, Shodash Vargas (16 divisional charts), Shadbal (strength of planets), Dashaphal, Transit and Longevity. Matching - Horoscope matching on the basis of Ashtakoot Guna Matching and Manglik Dosh Matching. Varshphal - Traditional/Modern Annual chart, Patyansh, Mudda and Vimsottari Dasha. Numerology - Radical Number, Lucky Number, Name Number Calculations, List of Remedies, Deciding the favourable name according to Numerology, Name Number Predictions. Muhurat - Muhurat for Job, Business, House Warming (Grah Pravesh), Marriage etc. Panchang - Create table of panchang containing Tithi, Vaar , Nakshatra , Yog, Karan for any year. Mundane - Kundli software leostar Mundane gives predictions about national and international affairs. Most accurate and authentic horoscope software. Predictions made by you can be added. Horoscopes can be kept in different categories like sportspersons, politicians etc for research work. Leostar already contains birth details of more than 5000 celebrities like film stars, sports persons, politicians, world leaders, musicians and stalwarts of other fields. You can take printout or single /double side, make PDF file which can be emailed. In LeoStar, all operations of software are controlled on one screen. In LeoStar, you can customize the color and font style. Having everything on one screen is just amazing and highly beneficial. All Horoscope Models can be printed. The software can be stored in a CD or DVD. You can make PDF file in single click. Various predictions- Navamsa, planet, house reading, matching, mahadasha, antardasha, gochar, varshphal and 30 year prediction. Wearing of Gems and Predictions and Analysis related to Monetary and health related graph of Astrology and Match Making Program in Hindi and English. Reading Material for Palmistry, Numerology, Vastu, Astrology, Kaalsarpa Yoga, Analysis of Mangal Dosh. Horoscope software applications Leostar series are based on several methods of ancient Indian astrology. These applications are used in preparing horoscope reports, to find out several astrological factors, calculations, predictions etc. Depending on the type of application, astro software applications provide several features such as finding Muhurat, checking marital compatibility, personal predictions, baby name recommendations, gemstone recommendations etc.